The loss of the ancient world’s single greatest archive of knowledge, the Library of Alexandria, has been lamented for ages. But how and why it was lost is still a mystery. The mystery exists not for lack of suspects but from an excess of them. Alexandria was founded in Egypt by Alexander the Great. His successor as Pharaoh, Ptolemy I Soter, founded the Museum (also called Museum of Alexandria, Greek Mouseion, “Seat of the Muses”) or Royal Library of Alexandria in 283 BC. The Museum was a shrine of the Muses modeled after the Lyceum of Aristotle in Athens. The Museum was a place of study which included lecture areas, gardens, a zoo, and shrines for each of the nine muses as well as the Library itself. It has been estimated that at one time the Library of Alexandria held over half a million documents from Assyria, Greece, Persia, Egypt, India and many other nations. Over 100 scholars lived at the Museum full time to perform research, write, lecture or translate and copy documents. The library was so large it actually had another branch or “daughter” library at the Temple of Serapis. The first person blamed for the destruction of the Library is none other than Julius Caesar himself. In 48 BC, Caesar was pursuing Pompey into Egypt when he was suddenly cut off by an Egyptian fleet at Alexandria. Greatly outnumbered and in enemy territory, Caesar ordered the ships in the harbor to be set on fire. The fire spread and destroyed the Egyptian fleet. Unfortunately, it also burned down part of the city – the area where the great Library stood. 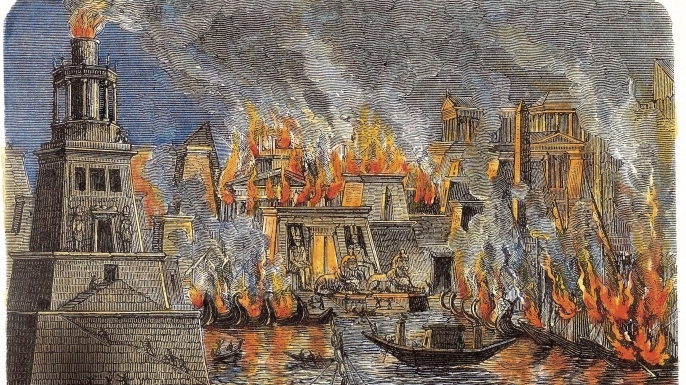 Caesar wrote of starting the fire in the harbor but neglected to mention the burning of the Library. Such an omission proves little since he was not in the habit of including unflattering facts while writing his own history. But Caesar was not without public detractors. If he was solely to blame for the disappearance of the Library it is very likely significant documentation on the affair would exist today. The second story of the Library’s destruction is more popular, thanks primarily to Edward Gibbon’s “The Decline and Fall of the Roman Empire”. But the story is also a tad more complex. Theophilus was Patriarch of Alexandria from 385 to 412 AD. During his reign the Temple of Serapis was converted into a Christian Church (probably around 391 AD) and it is likely that many documents were destroyed then. The Temple of Serapis was estimated to hold about ten percent of the overall Library of Alexandria’s holdings. After his death, his nephew Cyril became Patriarch. Shortly after that, riots broke out when Hierax, a Christian monk, was publicly killed by order of Orestes the city Prefect. Orestes was said to be under the influence of Hypatia, a female philosopher and daughter of the “last member of the Library of Alexandria”. Although it should be noted that some count Hypatia herself as the last Head Librarian. 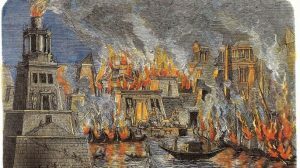 Alexandria had long been known for its violent and volatile politics. Christians, Jews and Pagans all lived together in the city. One ancient writer claimed that there was no people who loved a fight more than those of Alexandria. Immediately after the death of Hierax a group of Jews who had helped instigate his killing lured more Christians into the street at night by proclaiming that the Church was on fire. When the Christians rushed out the largely Jewish mob slew many of them. After this there was mass havoc as Christians retaliated against both the Jews and the Pagans – one of which was Hypatia. The story varies slightly depending upon who tells it but she was taken by the Christians, dragged through the streets and murdered. Some regard the death of Hypatia as the final destruction of the Library. Others blame Theophilus for destroying the last of the scrolls when he razed the Temple of Serapis prior to making it a Christian church. Still others have confused both incidents and blamed Theophilus for simultaneously murdering Hypatia and destroying the Library though it is obvious Theophilus died sometime prior to Hypatia. The final individual to get blamed for the destruction is the Moslem Caliph Omar. In 640 AD the Moslems took the city of Alexandria. Upon learning of “a great library containing all the knowledge of the world” the conquering general supposedly asked Caliph Omar for instructions. The Caliph has been quoted as saying of the Library’s holdings, “they will either contradict the Koran, in which case they are heresy, or they will agree with it, so they are superfluous.” So, allegedly, all the texts were destroyed by using them as tinder for the bathhouses of the city. Even then it was said to have taken six months to burn all the documents. But these details, from the Caliph’s quote to the incredulous six months it supposedly took to burn all the books, weren’t written down until 300 years after the fact. These facts condemning Omar were written by Bishop Gregory Bar Hebræus, a Christian who spent a great deal of time writing about Moslem atrocities without much historical documentation. So who did burn the Library of Alexandria? Unfortunately most of the writers from Plutarch (who apparently blamed Caesar) to Edward Gibbons (a staunch atheist or deist who liked very much to blame Christians and blamed Theophilus) to Bishop Gregory (who was particularly anti-Moslem, blamed Omar) all had an axe to grind and consequently must be seen as biased. Probably everyone mentioned above had some hand in destroying some part of the Library’s holdings. The collection may have ebbed and flowed as some documents were destroyed and others were added. For instance, Mark Antony was supposed to have given Cleopatra over 200,000 scrolls for the Library long after Julius Caesar is accused of burning it. It is also quite likely that even if the Museum was destroyed with the main library the outlying “daughter” library at the Temple of Serapis continued on. Many writers seem to equate the Library of Alexandria with the Library of Serapis although technically they were in two different parts of the city. The real tragedy of course is not the uncertainty of knowing who to blame for the Library’s destruction but that so much of ancient history, literature and learning was lost forever.